Here is a quick report from Venice! We were set to fish Friday, Saturday and Sunday but the weather blew us out Friday and was not much better Saturday but Danny Wilsons crew from Mississippi said they could handle the rough seas if the Freeman could! I wasnt sure if the boat could take 4-6ft seas with some 8ft mixed in and fish comfortable but I was shocked! The boat handled herself very well! We were able to cruise at about 25-30 mph hour all day with a little 35 mph mixed in! Tuna is what the crew wanted so we headed south and had baits in the water at 8:30 am! It was a little slow to start but it wasnt long before it was non stop action! A little live bait, some popper action and some caught on the troll! All in all, we finished the day with a 6 man limit of yellowfin and amberjack! 18 yellowfin, 6 amberjack! The tuna were all 25-40 pound fish and the jacks were all about 40! 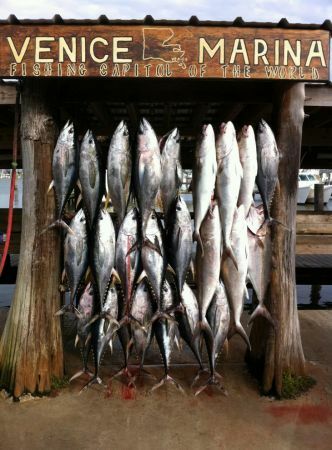 We may have had one tuna reach 50 pounds! Not huge fish but a ton of action! Sunday, with two people on the boat, we were able to hunt down 5 nice yellowfin, 30-50 pounds, one wahoo and a limit of jacks! I left my camera on the boat so you will have to wait til next week for most of the pics but Aaron shot a pic with his phone on Saturday of the board shot so I will post that! We still have dates open to fish! The big fish should show any day now but til they do, we will be catching something! It has been good action for the last few weeks! The wahoo bite has been very good and the smaller tuna still eat the same! Keep in mind that we DO NOT charge extra for fuel! You know exactly what you will pay with us! The new Freeman is a sweet ride, lets go fishing!